Aim: Nine-center meditation of simplified Kundalini yoga was formulated by sage Vethathiri Maharishi and improves the functions of endocrine glands. It involves the following centers: Mooladhara, Swadhistana, Manipuraga, Anahatha, Visuddhi, Agna, Thuriya, Shakthi Kalam and Shiva kalam. Meditation is done on all the nine-centers, seven of which are endocrine glands located within the physical body and Shakthi kalam, Shiva kalam are Universal field and absolute space respectively. Meditation commences at Mooladhara Chakra; followed by meditation on each of other chakras and concludes when the mind merges with absolute space. Mind is a magnetic wave with self-rotating movement. The speed of mind is measured in terms of mental frequency. Scientists have discovered through the use of electro encephalograph (EEG) that the mind works at frequencies ranging from 1 to 40 cycles/s. These frequencies have been classified into four. They are (1) beta wave (14-40 cps), (2) alpha wave (8-13 cps), (3) theta wave (4-7 cps), (4) delta wave (1-3 cps). Methods: To prove the research concept, forty-four students of two different schools pursuing 11 th standard were selected and chosen one as an experimental group and another one as a controlled group. The former group alone underwent and practiced the nine-center meditation for 6-month. The mind frequencies of the students of both groups were measured by EEG test in Vethathiri Maharishi's Kundalini yoga research center and their body mass index (BMI), pulse rate, blood pressure (BP) were measured by a medical officer in the center. 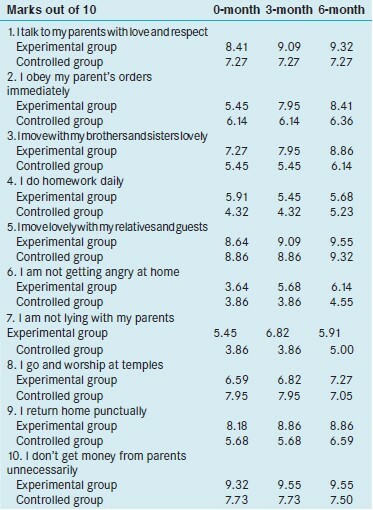 Results: The result show that after 6-month regular practice of the nine-center meditation, the former group of students progressed well compared to the later in the following: Increase in BMI, academic marks, harmony in relation with parents, teachers, friends and decrease in pulse rate, BP and mind frequencies. The nine-center meditation regulates and promotes the functions of the endocrine glands and mind. Conclusion: That streamline and uplift physiological and psychological functions of humans especially student community very rapidly. Forty-four boy students of two different schools pursuing 11 th standard were selected and divided equally one as an experimental group and another one as a controlled group to prove the research concept. A legal permission was obtained from the Chief Educational Officer of Coimbatore district to conduct an experiment at government schools. The experimental group students were given initiation to Agna meditation, the first step, where the center for life energy was shifted from Mooladhara center to Agna center through the Spinal cord. The other four centers viz. Swadhistana, Manipuraga, Anahatha, Visuddhi were bypassed during this process, for the simple reason that passing through each of these centers will consume a lot of time and effort. Next, they were initiated Thuriya, Shakthi kalam and Shiva kalam (called Thuriyatheetha). Finally, the left four centers were initiated. This meditation has been designed in such a way that meditation on individual chakras becomes easy once the aspirant begins to meditate on Agna, Thuriya and Thuriyatheetha. Nine-meditation commences at Mooladhara chakra; followed by meditation on each of other chakras and concludes when the mind merges with absolute space. They practiced this meditation daily 1 h. The controlled group students were not given any meditation. Both groups were followed for 6-month for observing changes. Electroencephalography is a technique for recording and interpreting the electrical activity of the brain. The nerve cells of the brain generate electrical impulses that fluctuate rhythmically in distinct patterns. In 1929, German scientist Hans Berger developed an electroencephalograph, an instrument that measures and records these brain-wave patterns. The recording produced by such an instrument is called an electroencephalogram, commonly abbreviated EEG. To record the electrical activity of the brain, 8-16 pairs of electrodes are attached to the scalp. Each pair of electrodes transmits a signal to one of the several recording channels of the electroencephalograph. This signal consists of the difference in the voltage between the pair. The rhythmic fluctuation of this potential difference is shown as peaks and troughs on a line graph by the recording channel. The Mind frequencies of the students of both groups were measured periodically in Vethathiri Maharishi's Kundalini yoga research center by a technician using EEG test and results were obtained from a neurologist belonging to the center. 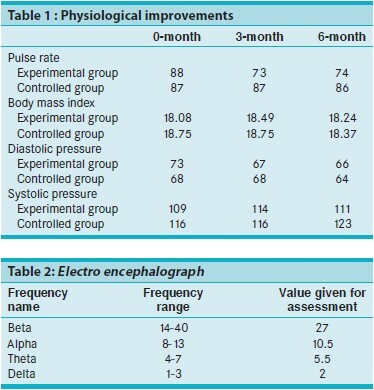 The audio of nine-center meditation comprising of 45 min was connected with EEG. Each chakra was meditated for 5 min. The experiment group students in 0-month test and controlled group students in 0-month and 6-month do not know how to do this meditation. But they were broadcasting the meditation and asked to sit simply with close eyes and their frequencies were recorded for the purpose of comparing with other tests and opposite group. Their body mass index (BMI), pulse rate, blood pressure, (BP) were measured periodically by a medical officer in the center. A self-assessment questionnaire comprising of 30 queries was prepared and given to assess their behavior in the home, class room and friends circle. The controlled group students were not tested anything in the 3-month so, their 0-month test values were taken for 3-month. Evaluation method: Each student was given the average number of that particular frequency in every chakras. For e.g. If a student's frequency is found alpha at Mooladhara chakra, he is given the value "10.5" as alpha lies between 8 and 13. Finally, the group averages are calculated and presented here. The academic marks for experimental group increased from 529 to 594. Whereas the controlled group decreased from 653 to 606. Evaluation method: Each question carried maximum 10 marks and minimum 0 marks in the self-assessment questionnaire. For, e.g. Question no. 1: I talk to my parents with love and respect. After 6-month regular practice of the nine-center meditation, the former group of students progressed well compared to the later in the following: Increase in BMI, academic marks, harmony in relation with parents, teachers, friends and decrease in pulse rate, BP and mind frequencies. When brain-wave frequency reduces to alpha from beta, it effects calmness, good memory power, concentration, decreased pulse rate, normalized BP, creativity etc. Experimental group students have reached alpha wave frequency in seven centers. Theta wave provides heightened intuition, healing of body, reprogramming of the subconscious mind etc. They have reached theta in last two centers. No students reached the delta wave, which is the ultimate frequency level giving connection with divine. 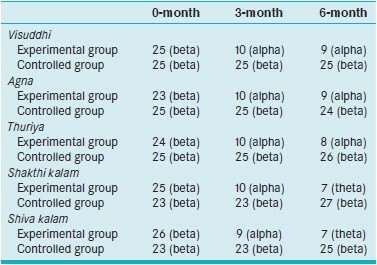 The experimental group students progressed significantly than controlled group students in most queries/exams except some declines in some questions due to any other diversions whereas controlled group students showed increased performance than experimental group in few queries/exams, which may be due to any other motivations or realization they got. 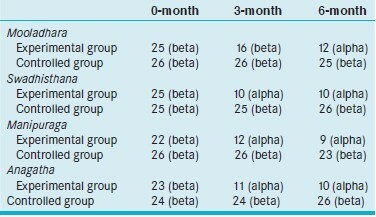 But as a whole, the overall growth percentage is higher for the experimental group. It could be witnessed that this experimental group students have improved physically, spiritually, intellectually, ethically and culturally. The above result shows if, one practices the yoga regularly, the can gain sound health, long life, wisdom and peace in life. Our ancient Indian siddhas had understood the greatness of inward travel without which one cannot get enlightened. So they symbolically told the word 'Divine' which denotes "Dive+ in". They gave rituals like manthras to arouse the chakras and light gazing to enhance aura. Vethathiri Maharishi, who came in Tamil Siddhas Heritage, has simplified traditional Kundalini yoga and made easier to the modern world. His nine-center meditation regulates and promotes the functions of the endocrine glands and mind so that streamline and uplift physiological and psychological functions of humans especially student community very rapidly. "Vethathiri Maharishi Dead". The Hindu. 29; March, 2006. [Last retrieved on 2017 Nov 17]. Vethathiri Maharishi, Rejuvenating Life Force and Mind/Special Meditations/Nine Center Meditation. Erode: Vethathiri Publications; 2010. p. 82-92. Vethathiri Maharishi, Rejuvenating Life Force and Mind/Frequencies of Mind. Erode: Vethathiri Publications; 2010. p. 36. Government of Tamil Nadu has Issued an Order vide G. O. no. 168 dt. 16.7.2007 Highlighting the Importance of "Manavalakalai Yoga (SKY) Practice" to be Introduced in Schools. Priyan T. The Poetry of 18 Siddhas and the Dessertation/Shiva Vakkiayar. Chennai: Narmatha Publications; 2007. p. 316. Birch BB. Beyond Power Yoga. New York: Simon and Schuster; 2010. p. 218. Hunder GG. Mayo Clinic On Arthritis. New York: Orient Paperbacks; 2006. p. 86. Khan B, Meditation with a Peaceful Mind, New Delhi, Barb Gates. Ch. 1. ; 2014.